Daniel Joseph Sullivan (born September 1, 1939) was an American football offensive lineman in the National Football League (NFL) from 1962 through 1972. During that span he appeared Super Bowl III and Super Bowl V for the Baltimore Colts. He played college football for Boston College. James Clark Hudson (March 31, 1943 – June 25, 2013) was a professional American Football defensive back. He was one of the first players to ever win a national championship in college and a Super Bowl as a professional. 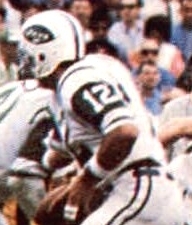 Hudson played for the New York Jets from 1965 to 1970, playing in both the AFL and NFL. He started in Super Bowl III for the Jets, and made a key interception just before the end of the first half. James Buis Richards, Jr. (born October 28, 1946) is a former professional American football defensive back in the National Football League. After attending Virginia Tech, Richards played for the New York Jets in 1968 and 1969. He was a member of the Super Bowl III winning Jets team. James Bayard Turner (born March 28, 1941) is a former American football player. A quarterback and placekicker, he played college football for Utah State University and was signed as a free agent in 1964 by the American Football League's New York Jets head coach Weeb Ewbank. "Tank" kicked a then record 145 points in the 1968 regular season, with a professional football record 34 field goals. Turner kicked for nine points in the AFL Championship game win over the Oakland Raiders, and ten points in the Jets's 16-7 defeat of the Baltimore Colts in the Third World Championship of Professional Football, Super Bowl III.The last of Turner's three field goals in Super Bowl III was for 9 yards, the shortest in Super Bowl history. At that time, the goal posts were located at the front of the end zones. They have since been moved to the back, so it's no longer possible to kick a field goal from this short a distance. Mike Clark of the Dallas Cowboys tied Turner's record for the shortest Super Bowl field goal in Super Bowl VI.In the locker room after the game, on national television (NBC-TV), Turner shouted "Welcome to the AFL !" Following the AFL-NFL merger, Turner also played with the Denver Broncos for another nine seasons and kicked four points in a losing effort in Super Bowl XII against the Dallas Cowboys, connecting on a 47-yard field goal and an extra point following a 5-yard touchdown run by Rob Lytle. He was inducted into the Denver Broncos Ring of Fame in 1988.Turner finished his career with 304 of 488 (62%) field goals and 521 of 534 extra points, giving him 1,439 total points. Joseph William Namath (; born May 31, 1943), nicknamed Broadway Joe, is a former American football quarterback and actor. He played college football for the University of Alabama under coach Paul "Bear" Bryant from 1962 to 1964, and professional football in the American Football League (AFL) and National Football League (NFL) during the 1960s and 1970s. Namath was an AFL icon and played for that league's New York Jets for most of his professional football career. He finished his career with the Los Angeles Rams. He was elected to the Pro Football Hall of Fame in 1985. He retired after playing 143 games over 13 years in the AFL and NFL, including playoffs. His teams had an overall record of 68 wins, 71 losses, and four ties, 64–64–4 in 132 starts, and 4–7 in relief. He completed 1,886 passes for 27,663 yards, threw 173 touchdowns, and had 220 interceptions, for a career passer rating of 65.5. He played for three division champions (the 1968 and 1969 AFL East Champion Jets and the 1977 NFC West Champion Rams), earned one league championship (1968 AFL Championship), and one Super Bowl victory (Super Bowl III). In 1999, he was ranked number 96 on The Sporting News' list of the 100 Greatest Football Players, the only player on the list to have spent a majority of his career with the Jets. In his 1975 autobiography, Bryant called Namath the most natural athlete he had ever coached.Namath is known for boldly guaranteeing a Jets' victory over Don Shula's NFL Baltimore Colts in Super Bowl III (1969), then making good on his prediction with a 16–7 upset (the win remains the Jets' only Super Bowl appearance). Already a celebrity, he was now established not only as a sports icon but a pop culture icon. He subsequently parlayed his notoriety into success with endorsement deals and as a nightclub owner, talk show host, pioneering advertising spokesman, theater, motion picture, television actor, and sports broadcaster. He remained a highly recognizable figure in the media and sports worlds nearly half a century after his brashness cemented his identity in the public mind. John Thomas Neidert (born June 18, 1946) is a former American football linebacker who played three seasons with the Cincinnati Bengals, New York Jets and Chicago Bears. He was drafted by the Bengals in the sixth round of the 1968 NFL Draft. Neidert played college football at University of Louisville and attended Archbishop Hoban High School in Akron, Ohio. He was a member of the New York Jets team that won Super Bowl III. Lenny Lyles (January 26, 1936 – November 20, 2011) was a professional American football defensive back who played 12 seasons in the National Football League (NFL). He started in Super Bowl III for the Baltimore Colts. The 6-2, 202-pound Lyles was recruited by the University of Louisville in 1954, when he broke the school's color barrier for scholarship athletes. Lyles remains Louisville's all-time scoring leader for a non-kicker with 300 points. After a successful collegiate career, where Lyles was known for his return skills, he was drafted by the Baltimore Colts in the first round of the 1958 NFL Draft. He spent one year with the Colts before joining the 49ers in 1959. After two seasons in San Francisco, Lyles returned to the Colts where he remained until the end of his career in 1969. Lyles finished his professional career with 2,161 return yards and averaged 26.7 yards per return. Lyles spent 27 years as an executive with Brown & Williamson in Louisville. NFL's Greatest Games is a series of television programs that air on NFL Network, ESPN and related networks. They are condensed versions of some of the most famous games in the history of the National Football League, using footage and sound captured by NFL Films, as well as original interviews. All installments produced before 2015 are 90 minutes in length, and are presented with a title in respect to the game being featured. Starting in 2015, new installments produced run for either 30 minutes, 60 minutes, or 90 minutes, and no longer have a title beyond the actual game itself that is featured. The series began with Super Bowl III, the New York Jets' 16-7 upset of the Baltimore Colts. ESPN debuted the program in 1999, on the 30th anniversary of the original game. More telecasts followed in the ensuing months. In 2007, NFL Network unveiled Super Bowl Classics, a version of this program using complete videotaped games. The "NFL's Greatest Games" banner is also occasionally used for episodes of the 1970s public television series The Way It Was that covered classic NFL games prior to 1958. Ordell Wayne Braase (March 13, 1932 – March 25, 2019) was an American football defensive end in the National Football League. He played with the Baltimore Colts throughout his career. While Braase was with the Colts they won the NFL Championship three times, in 1958, 1959 and 1968. He was a Pro Bowl pick in both 1966 and 1967. In his final season (1968), the Colts went to Super Bowl III, on January 12, 1969, only to lose to the New York Jets. Randy Beverly (born April 3, 1944) is a former professional American football player. He played cornerback for the American Football League's New York Jets and is best known for making two key interceptions that helped the Jets to their historic victory in Super Bowl III in 1969. Ronald Dean Porter (born July 27, 1945) is a former American football player who played linebacker for seven seasons in the National Football League for the Baltimore Colts, Philadelphia Eagles, and Minnesota Vikings. Porter graduated from Yuba City High School in 1963 and played college football at the University of Idaho in Moscow. He was a member of Phi Gamma Delta fraternity and majored in marketing.Porter was a fifth round selection of the Colts in the 1967 NFL/AFL Draft, the 126th overall pick. He was a member of the 1968 Colts team that won the NFL Championship, but were upset in Super Bowl III.